First, I would be remiss if I forgot to mention that this post is dedicated to my father – a man whose sweet tooth knows no limits! Happy Father’s Day, Dad. You’re the best. I love you – even more than either of us love sweets! I’ve been making a fair amount of ice cream lately, all of which have been rather “naked”. So, instead of making one ice cream topping, I decided to make three and serve them with a batch of freshly whipped up “vamilla” ice cream. Well, this “vamilla” ice cream (though very creamy and delicious) needed a little sprucing up. So, using some fresh berries, chocolate and cream, I whipped up (ha, get it?) three sauces that I will henceforth affectionately refer to as “Neapolitan Sauces” because they pay homage to the good ol’ Neapolitan ice cream: strawberry, chocolate and “vanilla”. Simple! 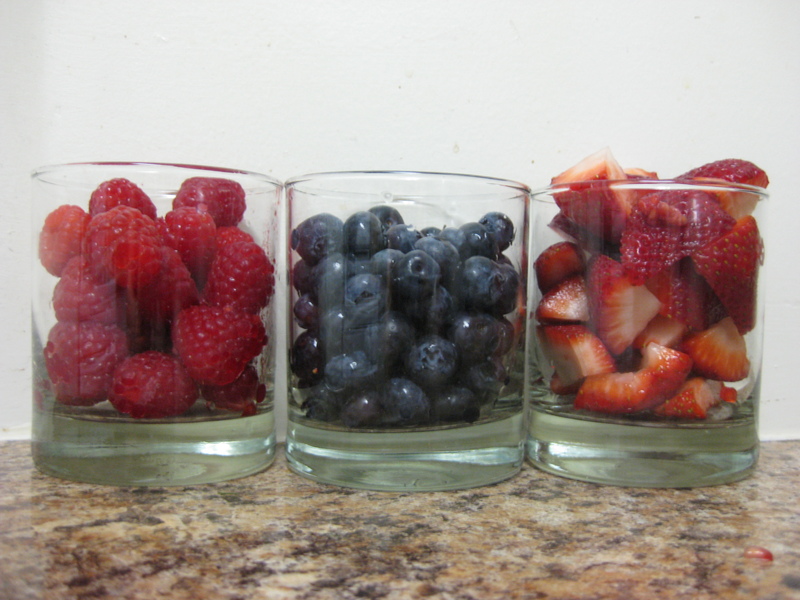 Puree all three berries in the blender. Add in 2-3 tablespoons of sugar (if the berries are really sweet and in season, you won’t need as much sugar) and taste. Add a few squirts of lemon juice and blend for a few more seconds. 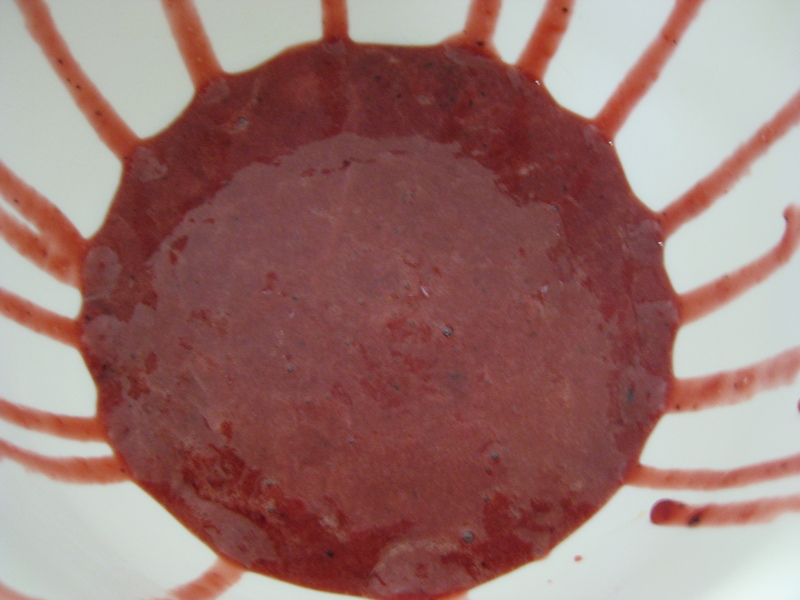 The triple berry sauce, strained to perfection! Once pureed, you’ll need to strain the sauce. Rest a fine mesh strainer over a bowl and pour 1/4 cup of the berry sauce on top of the strainer. Using a spatula, spread the sauce around on top of the strainer so that the blueberry skin, raspberry and strawberry seeds stay in the sieve and the sauce strains into the bowl. Repeat this process until you’ve strained the whole batch of triple berry sauce. Trust me, though this process is tedious, you’ll thank me when you don’t have to floss for the next week because of the annoying little berry seeds that have invaded your teeth! 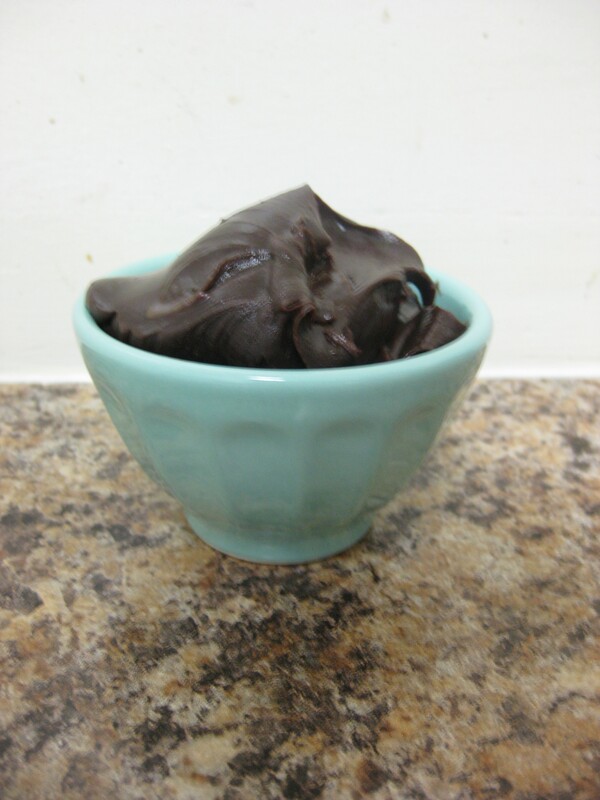 A big 'ole scoop of classic hot fudge! Mix the cream, brown sugar,. 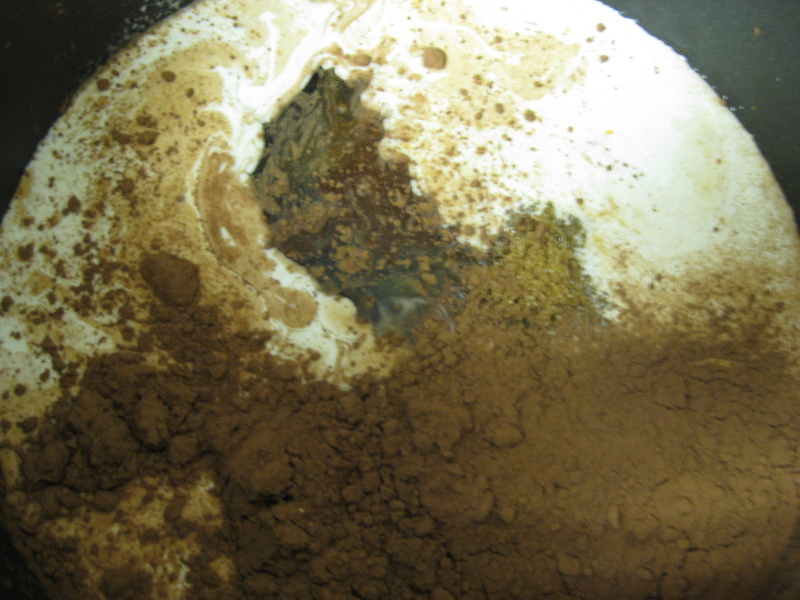 cocoa powder, and corn syrup in a large saucepan. Bring to a boil and cook, stirring frequently for 30 seconds. Remove from the heat and add the chocolate and butter, stirring until melted and smooth. Stir in the “vamilla”. Serve warm. This sauce can be stored in the refrigerator for up to two weeks. You’ll see in the photo on the right that the classic hot fudge gets rather thick when stored. Zap it in the microwave for a few seconds and it will be just as creamy and saucy as when you first made it on the stove-top. Make sure the whipping cream or heavy cream is very cold before beginning. 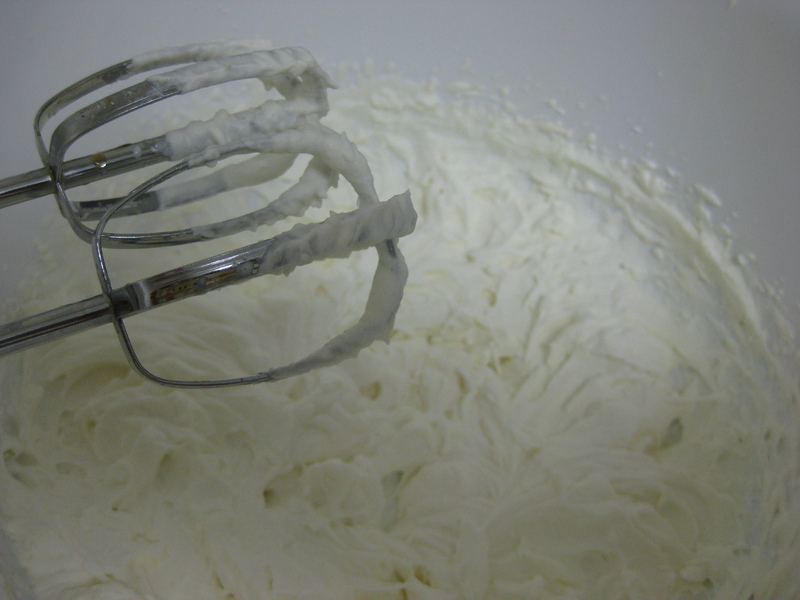 In warm weather (such as now) it’s helpful to chill the bowl and whisk or beaters as the cream will whip much faster. With an electric mixer and stainless steel bowl, whip the cream until it begins to mound and hold its shape. Whisk in 1 tablespoon sugar and the “vamilla”. Taste, then add the additional tablespoon of sugar if you wish (I did not!). Whip until the cream forms soft, droopy peaks. This is best whipped and served the same day, but if you whip it in advance and the cream separates, lightly whisk it before serving and you’ll be all set. Ladies and gentlemen, these sauces are delicious, and definitely should appear at any ice cream sundae bar. Enjoy!